Solar energy exploitation is one of the most promising ways to face major problems as the growing population, the climate change, the fossil fuel depletion and the high electricity price. The building sector is one of the most attractive areas for utilizing solar energy because of this sector is responsible for about the 35%-40% of the worldwide energy consumption. In this direction, a lot of research has been focused on the development of highly efficient systems which can operate totally or in hybrid mode with solar energy. Trigeneration systems for electricity, heating and cooling production are attractive energy systems which are able to produce the simultaneously all the demand energy quantities with increases system performance. Parabolic trough solar collector (PTC) is the most mature solar concentrating technology for useful heat production in medium and high temperature. 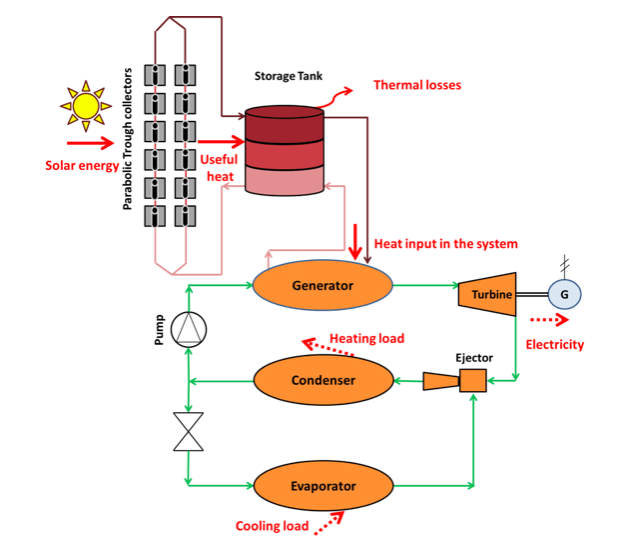 This kind of solar collectors is able to feed a trigeneration system for heating, cooling and electricity production, as it is depicted in figure 1. The suggested configuration includes a solar field with 100 m2 PTC, a sensible heat storage tank of 4 m3 with thermal oil and the trigeneration system. The investigated trigeneration system includes a generator, a vapor turbine, an ejector device, a condenser and an evaporator. The working fluid in this system is R141b which is an ideal working medium for temperature levels up to 200oC. The electricity production is produced for the generator which is coupled to the turbine, the cooling production is produced at the evaporator and the heating production at the condenser. The evaporator temperature can be set at 10oC which the condenser temperature at 50oC. Figure 2 depicts an example of the optimization procedure with two criteria. The different points of this figure correspond to different design scenarios. There is an area of optimum cases which is called Pareto-front. Using the minimum distance criterion from the ideal design point leads to the determination of the optimum selection. 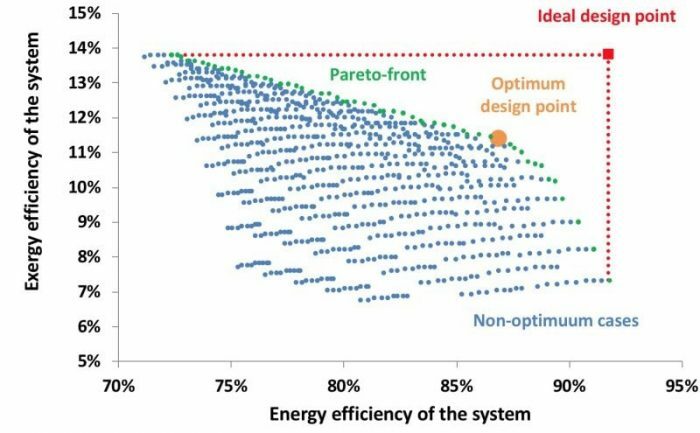 According to the results, the optimum design is the one with saturation temperature in the generator equal to 188.8oC, 6.7 K superheating and 3.6 turbine pressure ratio in the turbine. In this case, the electricity production is 4.6 kWel, the cooling production 7.9 kWcool, and the heating production 59.4 kWth, while the solar beam irradiation is 800 W/m2. The exergy efficiency is found 11.26%, the energy efficiency 87.39% and the system cash flow (from the energy savings) is found 7.694 €/h. The next step in this analysis is the financial evaluation of the optimum scenario. This analysis proved that the system can be viable with a payback period around 4 years. More specifically, the payback period is associated with the location solar beam potential. For a location with 1000 hours clean atmosphere per year, the payback period is close to 6 years, while for locations with 3000 hours of clean atmosphere yearly, the payback period is roughly over 2 years. In conclusion, the present analysis suggests a solar driven trigeneration system ideal for the building sector. This system produces high amounts of useful heating load, the fact that makes this system for buildings with great heating loads like hotels for example. The exergy and the energy efficiencies are around 11% and 88% which are promising and attractive values. The payback period of the system is extremely low for a solar-only system and it is ranged from 2 to 6 years. Thus, these results indicate that the present system can be used widely in the building sector with high heating loads and especially in locations with an adequate solar beam potential. 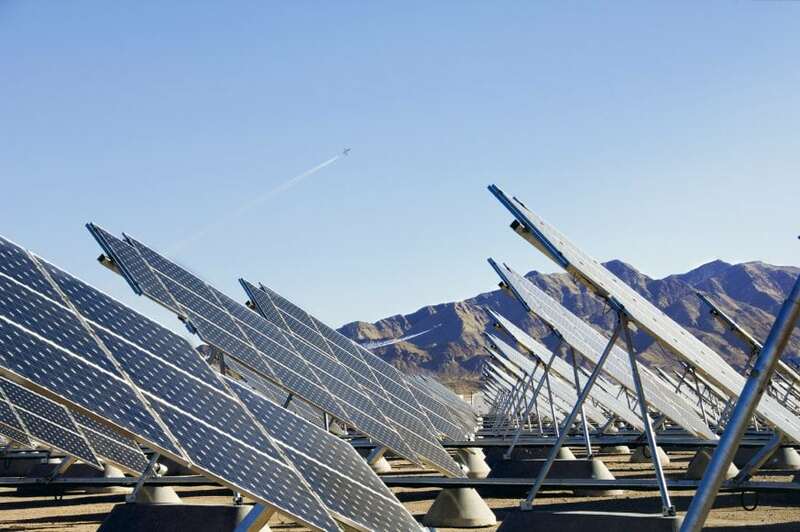 These findings are described in the article entitled Multi-objective optimization of a solar driven trigeneration system, recently published in the journal Energy. This work was conducted by Evangelos Bellos and Christos Tzivanidis from the National Technical University of Athens.